Players from Santa Fe, points north and south come together to play Go twice a week. At St. John’s College, Peterson Center Coffee Shop on Saturdays from 1pm to 6pm enjoy cafe food, coffee and beverages over a friendly game of go. At the Violet Crown Cinema on Tuesdays from 6pm to 10pm enjoy a beer, wine or supper in the bar while playing. Google maps for directions to both locations are shown below. 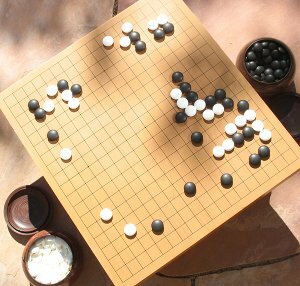 If Go is new to you, see What Is Go or stop by for more information – you could learn to play in 15-20 mins. There are many resources on the web for tutorials and background information, see Resources to the right. You can also play on line against other human players on the popular Go Servers. Though we’d rather you played face-to-face at the club! If you are a strong player stop by for a challenge game! If you can correctly identify the game used in the image to the right, there’s a free cup of coffee for you! Clue #1: the game was played between a 5 dan and an 8 dan. Clue #2: The 5 dan player took white. Clue #3: It was played in 2009 in Korea. For announcements and up to date information on events please see our News. To learn more about our programs please check out the other topics above.